This is the first of three posts in a row on Sixpoint Craft Ales from Brooklyn, NY. Founded in an 800 square foot garage in 2004 by Shane Welch, Sixpoint began producing excellent beers. Shane, who grew up in Milwaukee, started home brewing for the same reason many home brewers do, because he wanted a constant supply of flavorful, good beer. Quickly building his home brew expertise, Shane caught the attention of Dean Coffey the head brewer at the now defunct Angelic Brewing Company in Madison who hired Shane as an apprentice brewer. Over his three years at Angelic, Shane continued to hone his brewing skills before taking time off for a backpacking trip around the world, and I am sure stopping at many breweries along the way. Five years after he started home brewing, Shane founded Sixpoint. In 2005, Sixpoint began to distribute beer outside of the brewery. With the support of their local community Sixpoint was noticed by Union Beer Distributors and the rest as they say is history. Sixpoint now has a staggering amount of beers in their lineup. The lineup includes five year round brews: Sweet Action, Righteous Ale, Bengali Tiger, The Crisp and Resin; four seasonal beers: Harbinger, Apollo, Autumnation and Diesel; The Spice of Life series, a series of single hop beers that are released monthly; a line of beers they refer to as the Mad Scientists Series, their line of experimental and extreme beers; and the Beers for Beasts series which benefits the Humane Society of New York. Of course, they also have a line-up of small batch beers that are only available on tap at the brewery. Sixpoint began distributing in Wisconsin this past April with Jake, their Wisconsin rep at the helm. Jake has been very helpful in getting information on Sixpoint’s beers to me and I hope he is successful in raising awareness of this wonderful Brooklyn Brewery founded by a Milwaukee-native. You are probably wondering what’s up with the Sixpoint star. 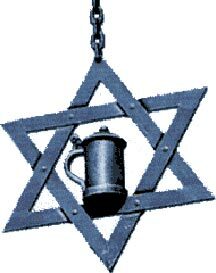 The brewer’s star or Brauerstern (in German) resembles the more well-known Star of David, but instead of finding its roots in the Judeo-Christian religious tradition, it is widely believed to be an Alchemical symbol. The earliest known occurrence of the star being adopted by brewer’s guilds is the early 1500’s, although it has unofficially been associated with brewing since the late 1300’s. Each of the points on the star represents a portion of the brewing process. One of the triangles is said to represent the three elements involved in brewing: fire, water and air. The other symbolizes the three ingredients in brewing: malt, hops and water. There is the noticeable absence of yeast from the list of ingredients because it was not until 1857 when Louis Pasteur discovered that yeast was the reason the ingredients fermented into beer. A more modern interpretation of the star indicates that the Brewers Star symbolizes a pure product with the six points representing the six aspects of quality brewing pure water, hops, grain, malt, yeast and the brewer. On to the review of the beer that is going to kick off Sixpoint Craft Ales week, Righteous Ale. On Beeradvocate Righteous Ale has a score of 90. Over at ratebeer it has a 94 overall and a 97 for style. They should be good men; their affairs as righteous: But all hoods make not monks. Beneath a deep blanket of snow there is a cereal grain that can survive the harsh winters and acidic soils - RYE. Like a draped hood over a monk, it is the righteousness inside that shines. The Made with Rye malt to provide a signature and distinct earthy character. Seasoned and dry-hopped with herbal and citrus hops. Truly Righteous. Considered a rye pale ale. I really enjoy the dry, earthy spice in the finish of this one. Tastes like an English-style pale ale. Hopped with cascade, Columbus, and Chinook hops. More malt-forward, however. Has a nice bready character which comes from the chocolate malt added during the brew process. The flavor started smooth and sweet with subtle citrus notes from the hops, followed by chocolate and bready notes with an earthy, spicy, bitter, dry finish. It was reminiscent of a good fresh baked rye bread with just the right amount of toasted rye added to enhance the flavor. Righteous is medium bodied and almost creamy with a light to medium level of carbonation. This would be an awesome beer to have served from either a firkin or on Nitro. Sixpoint has produced an excellent rye beer that has me hoping to have more of their beers in the near future. That’s all for tonight! Be sure to check back on Wednesday for a review of Bengali Tiger, and on Friday for a review of Sweet Action. Cut Throat Pale Ale – Finch’s Beer Co.
8-bit Pale Ale – Tallgrass Brewing Co.